Following this notification post about Ippolito new showroom's opening and new collection's launch, and after having visited it.. i'm manifold speechless! 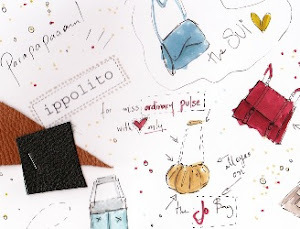 The Ippolito designer, Pavlina, is not only a super dynamic, beautiful and talented little lady, not only dear friend of mine, not only passionate with what she does and goes around the world to find it, but she also has... the most warm and cute showroom to host a piece of art in its diversity.. her bags! You can find them and admire (both bags and Pavlina !!) @ 10, Aggelou Geronda str., Plaka. WOW! I am loving these. Πολύ όμορφα τα σχέδιά της. Ιδιαίτερα το τελευταίο τσαντάκι το μπλε! Πόσο μ' αρέσει αυτό το χρώμα! the first bag is really really great! Did you get it? έψαχνα διακαώς ένα κρεμαστό purse!τι γαμάτο post encore un fois! s'efxaristw para polu ioannaki k sia! egw eimai speechless! what an honour! Love the first piece, its amazing!